The beach resort of Alcudia and the old town merge in the northernmost tip of Mallorca to give one of the largest beaches of the island. The beach has a new blue, tarmac walkway that streteches the length of the beach. Spreading from the Port of Alcudia to the adjoining C'an Picafort resort there are more than 10km (6 miles) of golden sand. At various points on the beach are small bar/restaurants, actually situated on the sand and offering a wide range of drinks, snacks and meals. The stunning panoramic views, combined with shallow waters, provide an ideal family holiday resort. The old town is approximately 2 miles inland and was the capital of Mallorca in Roman times. Today the area within the town walls still contains many ancient mansions, many of which now are the home of shops, cafes and "tapas" bars. Entry is via the "Portal del Moll", the ancient gateway from the port. The old town has a market on a Sunday, which is worth a browse around. The tourist office arranges guided walks around places of interest, starting at the Town Hall. The nearby resort of Playa de Muro, which is on the outskirts of Alcudia, is slightly more up market. Playa de Muro, also known as Platja de Muro, is a new resort which has sprung up between C'an Picafort and Alcudia in the centre of the Bay of Alcudia. Although quite remote, it is an ideal location for anyone looking for a peaceful and relaxing holiday. Adapted taxis are availabe for people wanting to travel a little. Contact us for further information. 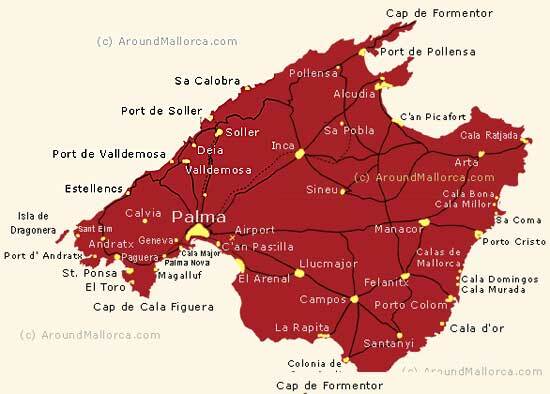 Puerto Pollensa is on the North East coast of Mallorca, close to the popular resort of Alcudia. There is a large harbour and promenade with several small beaches and a large artificial beach which is host to a variety of water sports. The waters are shallow making it a good place for families with small children. The beach also has a beach buggy and wooden walkway for disabled people. This is a quiet resort in comparison to places like Magaluf and Alcudia and has little in the way of tourist attractions locally although many agencies in the area can provide transport and tickets for such places. The nearby town of Pollensa is quite upmarket with a lovely selection of shops and restaurants. Pollensa has a market on a Sunday, and Puerto Pollensa has a market on a Wednesday. There are many shops and restaurants available in peak season, although entertainment tends to be in the hotels, with few bars or restaurants providing live music, making it the ideal place for a quiet holiday. The nearby village of Cala San Vincente is a popular place for tourists, although not so good for people with walking difficulties. Originally a small fishing village, C'an Picafort is now a thriving resort. Situated on the north coast of Mallorca it has a long sandy beach which stretches from the marina all the way west to the Port of Alcudia. Boat trips are available from the marina and to the east there is the small beach of Son Baulo and to the west the quieter beach of Playa de Muro. The town itself offers a large variety of cafes, bars and restaurants. In addition to the local and British aimed custom, there is a large emphasis on German and Scandinavian foods and beers. The resort is very popular with German tourists and certain restaurants do not provide a menu in English, preferring to aim for a different clientele. Other bars and restaurants are clearly aimed at solely the British, and there are many British owned bars in the area. Cala Ratjada is in the extreme North East corner of Mallorca, on a rocky coastline within easy reach of several beaches. Like the majority of resorts around mallorca Cala Ratjada was originally a small fishing village, only becoming popular with tourists in more recent years. There are still local fishermen, along with pleasure craft and a regular boat service to the nearby island of Menorca, which can be seen from Cala Ratjada. There are a large range of hotels, although the British tour companies are just discovering the resort. The area has always been very popular with German tourism and also many French. The majority of activity is around the quay, with its many bars and restaurants. There is a promenade to the Son Moll beach which continues past the port to the small beach of Cala Gat. Son Moll beach is 175m long and most of the hotels and apartments are concentrated around here. There are numerous restaurants and sunbeds, umbrellas and pedaloes are available. There is also a lifeguard on this beach. Cala Gat is only 70m long and in a more residential area. There is an open air bar and sunbeds and umbrellas are available. Shopping facilities are good, especially clothes and shoes, and Cala Ratjada offers various sporting facilities including golf, cycling and diving. Cala Mesquida is a small picturesque resort near to Cala Ratjada. There are only 3 hotels and access to the beach is either down the 99 steps from the main centre or from the promenade. This is ideal resort for anyone looking for a quiet and relaxing holiday. There are several bars and restaurants available and a small shopping complex. Palma Nova is situated in the south west of the island and was one of the earliest areas to be developed as a holiday resort. The resort has expanded over the years and now merges with the Son Matias area which leads directly into the neighbouring resort of Magaluf. The beach and promenade have been renovated over the years and directly opposite there are numerous restaurants and bars. Boat excursions on glass bottom boats and others can be taken from the jetty at Son Matias beach. Night life is quieter than the neighbouring Magaluf, with a variety of bars and live entertainment venues aimed at the family with less emphasis on the disco pubs and clubs geared towards the younger generation. Restaurants along the sea front cater to every taste and budget, ranging from fast food at McDonalds to some beautiful "a la carte" restaurants and several friendly cafeterias. Most bars and restaurants have a choice of either local drinks or imports. Situated on the south west coast of Mallorca this busy resort is set around a beautiful bay and has 3 beaches to tempt you, Playa La Romana, Playa Palmira, and Playa Tora. This small but busy resort is popular with all nationalities, especially the German tourists, but the number of bars and restaurants aiming at British clientel is on the increase as more tourists from the UK discover the area. It is close to the Port d'Andratx which is a popular area for visting film stars and celebrities. The beaches are well maintained, providing basic amenities such as sunbed hire and parasols as well as water sport facilities and trips on the "Glass Bottom Boat". You can gain access to each of the beaches from the fairly new promenade which stretches the length of the bay. Originally a small fishing resort, Paguera is now a bustling resort and the night life reflects this. There are numerous bars and clubs and although it is not as noisy as other resorts, it is not the place to go if you are looking for a quiet holiday. El Toro is a small village situated on the South West coast of Mallorca between the popular resorts of Magalluf and Santa Ponsa. The village is mainly residential consisting of a mixture of Spanish, English and German, some of which are in residence all year round and many of which have holiday homes and apartments. Over the last 15 years the local port, Port Adriano, has undergone extensive modernisation which is now attracting a lot of attention from the yachting community and tourists alike. The beach is small and clean and situated next to the port itself. This is a quiet area, except on weekends and Fiestas, when the residents have the chance to relax and enjoy their surroundings. There are a small number of restaurants available, ranging from local Mallorcan dishes to pizzas and fast food. Shopping facilities are basic, including the local Spar shop. Santa Ponsa is a popular resort situated on the south west coast of Mallorca. Since the '60s it has developed rapidly from a small village and now has it's own popular marina in addition to the usual resort features. There is a large, sandy beach which stretches the width of the bay, with a smaller beach at a small cove just off the Av. Rey de Jaime I. The beach was recently extended, as were several beaches in the Calvia area, using sand dredged from the bay, and has a promenade which cuts across it, dividing the area where there are a number of pine trees providing shade. Boat trips are available at regular intervals from the beach and the marina. Magaluf, in the south west of the island, is a typical example of the growth of Mallorcan tourism. It has been transformed over the last 40 years from a sleepy fishing village to one of the largest resorts on the island, where you can party 24 hours a day in one of the many Magaluf bars. The stylish promenade stretches from one end of the beach to the other, with a mixture of bars and restaurants mingling in with the hotels and tourist shops. No matter what your preference is, Magaluf has a bar to suit you, from quiet, relaxing chat bars to live music and disco bars and pubs. There are a variety of sports facilities, including water-skiing, jet-bike hire, pedal boat hire and mini-boats for hire. Regular boat trips are provided, including a trip on a catamaran and excursions on a glass bottom boat. After a relaxing day sunbathing and watching the world go by, when it gets to the night life be prepared to have fun! Magaluf boasts one of the largest nightclubs in Europe, B.C.M., as well as several smaller clubs and a never ending supply of bars, fun pubs and "theme" bars. Prices vary depending on the location and the facilities offered, with the named brand drinks often costing more than the "local" brands. Most bars have a large choice of draught and bottled beers, including imports from the U.K.
C'an Pastilla is on the south east coast of Mallorca, very close to Son Sant Juan airport and one of the first "British" resorts in the tourist boom of the '60's. This proximity to the airport can cause some problems with noise although the authorities do attempt to keep this to a minimum. The beach stretches from C'an Pastilla, through Playa de Palma, all the way to Arenal. The sand slopes gently to the sea and there are various watersports such as water ski-ing and windsurfing available. Pedaloes , parasols and sunbeds are available for hire. There are a number of restaurants and outdoor cafes or "Balearios" lining the promenade. There is really only one main street in C'an Pastilla, with hundreds of tiny, narrow back streets running off. There is a picturesque harbour and the marina-Club Marítimo San Antonio de la Playa-is situated at the edge of the bay. Restaurants and bars abound along the promenade and in the back streets. Originally the town of Colonia Sant Jordi was an agricultural and fishing village with tourists only starting to choose this destination as a holiday spot in the 1950s. Colonia Sant Jordi and neighbouring Ses Salines are famous for their extraction of salt and both towns carry this symbol in their town coat of arms. Salt is still extracted using traditional methods each year during a festival in August. Colonia de Sant Jordi is now a busy resort. The fishing harbour is still a major part of the town and its small beach looks out over several islets, with good views all the way to the Cabrera Archipelago. And this is the main reason to come here - boats run regularly to the National Maritime Park of Cabrera - an archipelago of islands about 10km to the south. This part of the southeast of Mallorca has some of the most magnificent and unspoilt beaches on the island, boasting white sands and sheltered waters. In addition to the town's small beach, there are two further sandy beaches a short walk to the east, and the further you go, the better the beaches become. A 20 minute walk will take you to one of the islands best, Es Carbo - this is where the Spanish Royal family come if they want some beach time. To the west lies the more accessible and better know beach of Platja Es Trenc.The beach of Es Trenc is the busiest of all the beaches in the area but is relatively sheltered and therefore has small waves and ideal for swimming or snorkelling. This stretch of beach is very long and at one side you’ll find nudist sunbathers. Most of Colonia Sant Jordi’s bars are located along the Carrer de Gabriel Roca or along the tapas route on Avinguda de la Primavera and nearby Carrer Estanys. On Carrer de Gabriel Roca is the Bar Tambuco that serves up a range of fruity cocktails while overlooking the beach. If you are looking for a quiet holiday away from the hustle and bustle then Cala Bona is the place for you. Situated on the North East coast of Mallorca this small fishing village is fast becoming a popular tourist resort for those who prefer a quiet holiday. Built around a small, picturesque fishing port this resort boasts several hotels and complexes, most of which provide a full range of entertainment. The beach of Cala Bona is about 550m long. The closest beach to the harbour is Sa Punta Roja. A little further north (going towards Costa de los Pinos) we fnd the beaches of Port Verd, Port Nou & Port Vell. There are a number of bars and restaurants in the area offering traditional Mallorcan dishes as well as the typical "British" fare. Nightlife is fairly quiet, although several bars now offer Live Entertainment nightly. The nearby resort of Cala Millor, which is within walking distance, is available if you fancy a change and a livelier night. The coastline is rocky with small bays and stretches of sand, which the local council have made excellent efforts to clean up in recent years. For golfers there are 4 courses in the area, 3 of them 18 hole and one 9 hole. Cala Millor is on the North East Coast of Mallorca, in between Cala Bona and Sa Coma. It is an ideal place for families, livelier than it's neighbours but still providing the charm of the original fishing village. The large beach, which some claim to be one of the best in Mallorca, is situated between two headlands which provide shelter. With shallow waters this is a superb place for families with small children. Sunbeds and parasols are available for hire, and a wide range of water sports are available. Public transport is limited in these areas but there are a large number of hire cars available, as well as bicycles and "buggies" which are ideal for this relatively flat resort. There are numerous shops and restaurants available and the night life ranges from quiet bistros to live music, sports bars and night clubs.